Over 300 women gathered in Provo, UT for the annual WAW conference. Colonel Grossman was one of the speakers. Texas Police Officer Gregory Stevens (right photo) will be with us at the Salt Lake City Sheepdog Seminar. May of 2015, Officer Stevens stopped two terrorists from committing mass murder. 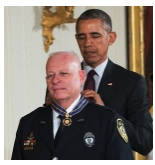 For his heroics, he was awarded the Medal of Valor by President Obama for "preventing a deadly act of terrorism." Watch the Officer Stevens receiving the Medal of Valor. Police officers and Military Personnel who register for $69.00 may bring a guest NO additional charge (active and retired). This discount applies to police officers and military, active or retired.